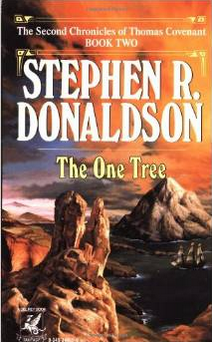 The Chronicles of Thomas Covenant is a series of ten books written by Stephen R. Donaldson, comprising of two trilogies and a tetralogy. The protagonist in the story is Thomas Covenant, an embittered and shunned leper whose fate brings him to the alternate reality of the Land as a savior. His opponent and manipulator is the evil Lord Foul the Despiser – an arch-enemy of the Creator. The story has faint reminiscences of the early Celtic literature, but the author has chosen to flip the coin, i.e., his hero has a lot of dark and grey shades to him. The whole body of stories is full of psychological undercurrents and the questionable fundamental instincts of humans. The Land serves as both a mythical world full of variety of races, castes, cultures, traditions, etc., presenting a wide arena of side-stories, and a creation of the subconscious mind of Covenant. Through the entire first trilogy, the biggest dilemma revolves around the existence and the reality of Land as Covenant journeys back and forth without being able to figure out whether the Land exists in reality or only his imagination. He grants himself the title of Unbeliever. The puzzle is hard for him because every time he arrives back from the Land, he is in the same state as he was in when he left. The time he spends in the Land is hard to account for in this world. Besides, the lay-out of the Land is a mirror of his psyche, e.g. Lord Foul could be Covenant’s own self-hatred, the illearth stone could be his leprosy and the health and beauty of the Land could be seen as everything left in his life that is worth preserving. The author goes into the discussion regarding the “Fundamental question of Ethics” right in the first book where he tries to bring home the concept of actions and consequences. What exactly is real – Things that are around you that you see, touch, feel, use or discard? The question is eternal and the answers are endless ranging from the concept of Maya in Indian vedic literature to modern day Matrix trilogy of movies to the world of dreams as depicted in Christopher Nolan’s “Inception“. Are the actions performed in dreams real? Can those have actual significance? Covenant tries for a long period of time to prove to himself that the Land is a dream and his actions are of no consequence. Until he realises that it does not matter whether the Land is real or not, what matters is that it holds significance for him. Whether it exists by some miracle, or whether it is a manifestation of his tortuous and twisted subconscious mind, the only way for him is through it. If he can save the Land, he might actually come to terms with his own existence. And he more or less achieves this at the end of first trilogy. While the first trilogy is all about Covenant, the second chronicles have an addition in form of another “real” person Linden. She also finds it difficult at first to resolve the dilemma of the reality of the Land. Unlike Covenant, who spent most of his time in the first chronicles in denying the power, denying his ability to control the wild magic of his white gold ring, thus denying the responsibility for the fate of Land, Linden finds her inability to heal the Land frustrating. However, she loathes possession and taking over Covenant’s ring for using the power, and therefore is left wondering about the reason for her presence in the Land. But, the theme of the second chronicles is to highlight the powerlessness that comes with power. This is depicted again and again as Covenant finds it difficult to control the wild magic. The only way he can win over ‘despite’ and Lord Foul is by surrendering the ring. When you look at both the chronicles combined, it appears a saga of finding the right balance for power, the first trilogy speaking of difficulties in triggering it, and the second trilogy speaking of difficulties in controlling it. But, in both cases the author highlights that any form of power binds the holder. Powerlessness is freedom, but it is freedom of inaction and the moral implications of that choice run much deeper than humans realise. When Covenant comes back from the Land the first time he writes a book about the intertwining nature of power and guilt. The powerlessness and the guilt of inaction can very easily trigger the self-loathing and despite on which Lord Foul thrives. On the other hand, holding a power and not achieving desired results with it also gives way to self-hatred and in turn to ‘despite’. Power is than a coin the other side of which is despise. And as Covenant discovers at the end of second trilogy, the only way to destroy ‘despite’ is to surrender power, or at least the sense of mastery over power. Linden has the ability to heal, both in real world as a doctor and in the Land, but that also has come from the assumed responsibilities and guilt in a way. The story of her life reveals how her ambition to become a doctor and save lives is very deeply rooted in the self-hatred and lack of forgiveness for not preventing the fate that met her parents. In her mind, she is the killer of her parents, she despises herself and yet in everyday life she is fighting death. Only, her chosen calling and her power to fight death does not bring her any happiness. The journey through the Land and fighting the Despiser acts as a purge and a healing experience for her. As noted above, these books tell a story that is multi-layered and very complex. It is in no way an easy read and are often subjected to harsh criticisms and jests. But if you have an intriguing mind, these books are like a catalyst. They ask difficult questions and let you find your own answers. A very very thought-provoking and serious kind of literature. In saying that, they are in no way perfect. There are plenty of open ends and conflicting behaviours, it is hard to find consistency in all the characters all the time. On a curious note, Donaldson grew up in India where his father worked with lepers. He employs some Sanskrit words including moksha, turiya, Samadhi, dukkha, dharmakshetra, ahmkara, etc. The problem is, as he has tried to create a protagonist in the mirror image of a conventional hero, he also assigns entirely different and to some extent opposite meanings to these words. He also uses terms from Semitic origin including Sheol, Jehannum, Herem, Elohim, etc. not always doing these quite justice either. He has taken the terms out of two ancient religions – Hinduism and Judaism – but doesn’t quite succeed in establishing a connection or logic for these. So, this is the summary of the chronicles as per our vision. What are your views for this article? Have you already read the books? Do share your remarks and thoughts via comments below. Does this review help you in making your decision to buy or read these books? Do not forget to share this article with your friends over various social networks via Twitter, Facebook, Google Plus and others. And yes, you may like to subscribe to our RSS feeds and follow us on various Social networks to get latest updates for the site to land right in your mail box.